Gardenscape Transport has been in business for nearly 60 years. Gardenscape Transport has become known internationally thanks to the hard work and dedication of Dave Kasmoch Sr. and his family. Gardenscape Transport was established in 1945 after Dave Kasmoch Sr. saw a need for trucks to deliver his products to customers. Nearly 60 years ago Dave Sr. had begun Gardenscape, Inc., a lawn and garden product company selling soils and mulches to area retailers. In 1990 Gardenscape Transport became incorporated. 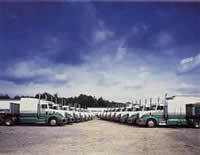 Now nearly 60 years later Gardenscape Transport has grown to have over 75 trucks in it’s fleet. Not only does Gardenscape Transport deliver products for the Gardenscape branch of the company, it is also a “for hire” trucking company. Gardenscape trucks deliver goods for other customers as far west as California and Oregon and as far east as Maine and Florida. Basically we deliver to 48 states. If you are interested in hiring Gardenscape Transport to deliver a load for you please contact Bill Shaner or one of our dispatchers at 800-255-1653. We take pride in our fleet of trucks. All of our trucks are newer model Peterbilt. We also use aluminum trailers so that we can haul heavier loads.